We recently had the opportunity to exhibit with our daughter brand, Factory Direct Promos, at SWANApalooza. We met so many great members of the waste management industry, re-connected with customers and introduced Factory Direct Promos’ easy solution to recycling in multi-family dwellings to a wide audience. Let’s learn more about SWANA, SWANApalooza and find out exactly how Factory Direct Promos is making multi-family recycling easy. 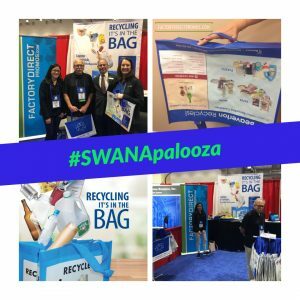 SWANApalooza is a four-day convention put on by the Solid Waste Association of North America (SWANA). The 2019 edition was held in snowy Boston, Massachusetts during February 25 – 28. SWANA is a professional organization that works to address the ever-evolving needs of the solid waste management industry. From integrating technology to employee safety and retention, SWANA brings together individuals from the private and public sectors to ultimately improve the handling of solid waste. SWANA provides support to the industry through a variety of training, conferences and more. A definite highlight of the event, was when David Biderman, Executive Director and CEO of SWANA, visited our booth. David has been at the helm of SWANA since 2015 and has been in the industry for over 20 years. SWANApalooza is a busy event for David, so everyone on the SBS and Factory Direct Promos team was happy to meet him and get the opportunity to show him our reusable recycling bags. Our daughter brand, Factory Direct Promos, was at SWANApalooza to raise awareness of their reusable recycling bags. These reusable bags are designed to make recycling in apartments, dorms and other types of multi-family dwellings easy. These bags work in the same way bins work in standard curbside recycling programs for single-family homes. The large bins just don’t cut it for apartments, but these compact and customizable bags work great. Tenants can simply fill the bag with items to be recycled and comfortably carry the bag to a designated collection bin or dumpster. Everything about the reusable recycling bags can be customized. The size, style and handles and even the artwork printed on the bags. All surfaces of the bag accept printing, so whether you are a property manager or landlord, a municipality or a waste management company, you can print your branding along with helpful tips and information about recycling for added convenience. It was great to meet so many people in the waste management industry and learn more about what they need and how we can help provide products and services to fit those needs. Learn more about SWANApalooza 2019 and find out how you can get a quote on reusable recycling bags by checking out the recap put together by Factory Direct Promos.